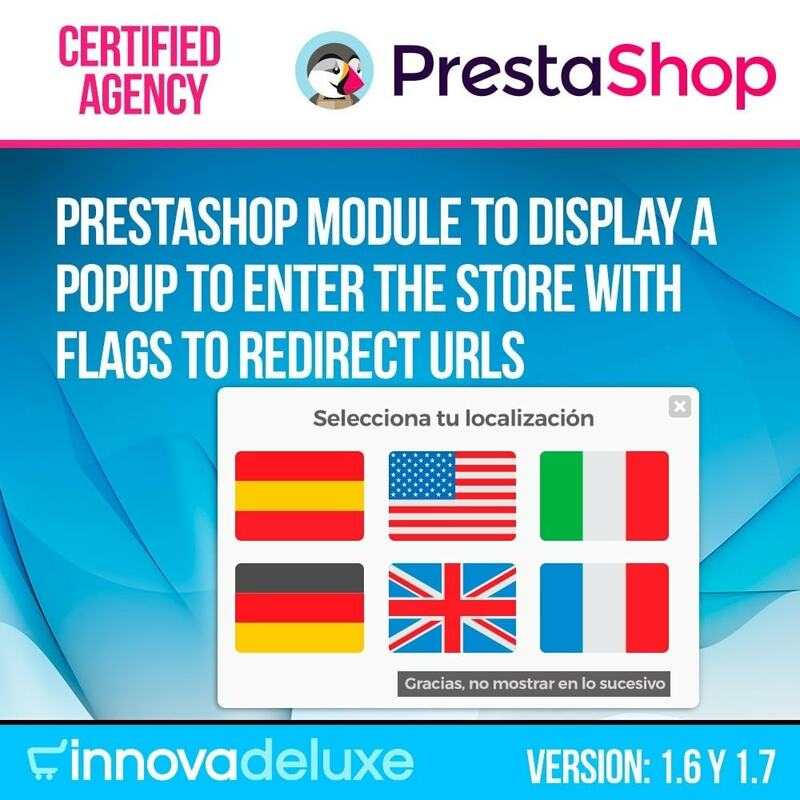 With this module you can take a popup window when entering your store, so that through flags (or other images) you can redirect visits to URLs for example from your distributors or your stores to other countries. 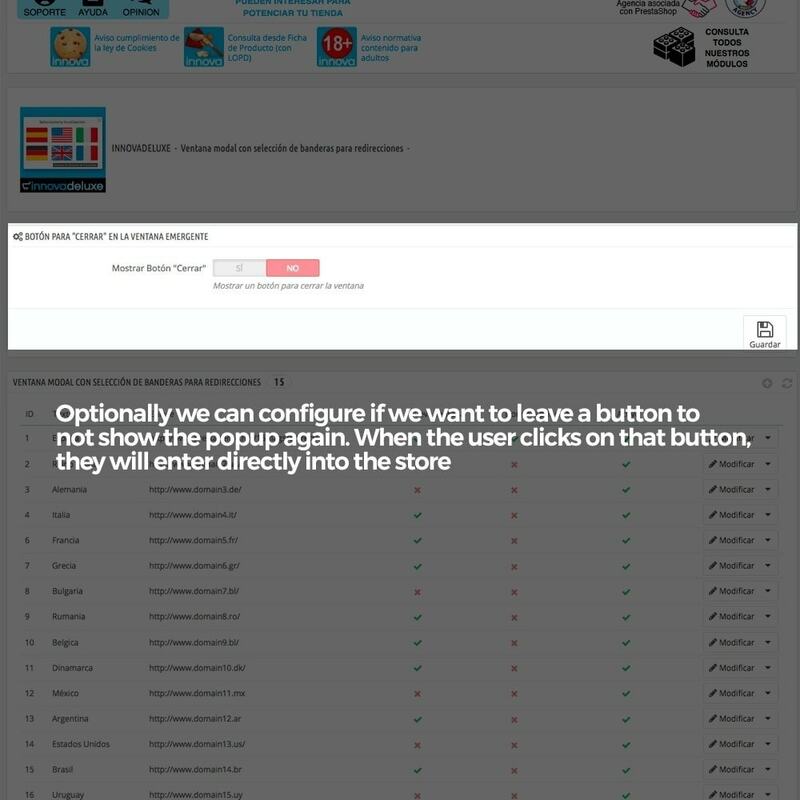 If you are a product wholesaler that has distributors in other countries and you only sell in your own country, now with this module you will be able to show a window prior to the entrance of your website so that the visitor selects his location, selecting for example the flag of your country, this way you can redirect those visits to your distributors. If you are not a wholesaler but you have several online stores, each one destined for a different country, you can now redirect your customers to the right store according to their origin. 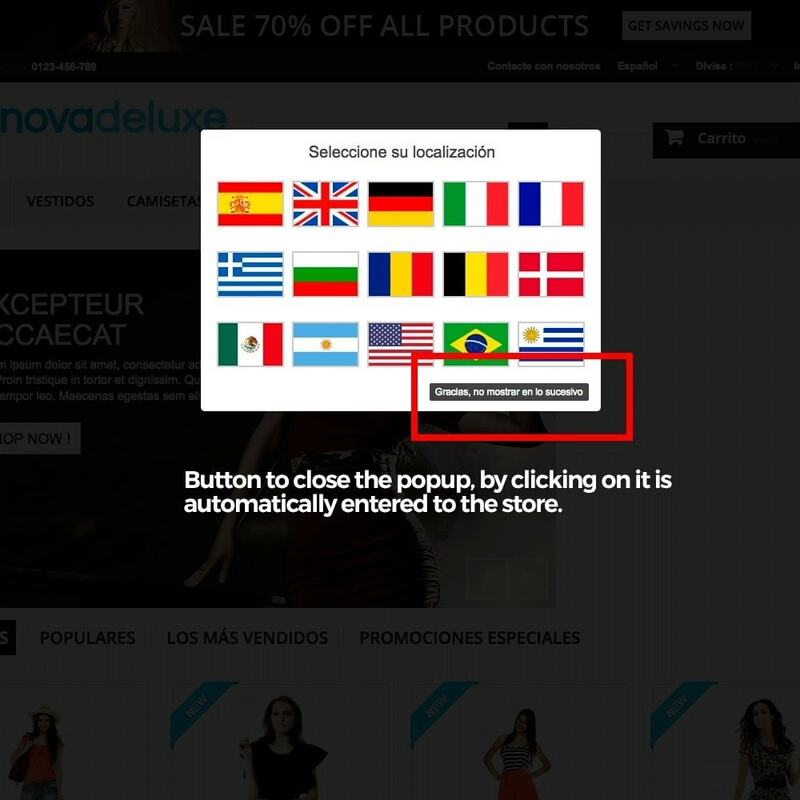 For example you can add flags for Spain, France, Italy, Germany, UK, etc ... so that the customer select the flag of their country. You can take the customer to the website of your branch in your country to be served in your own language. 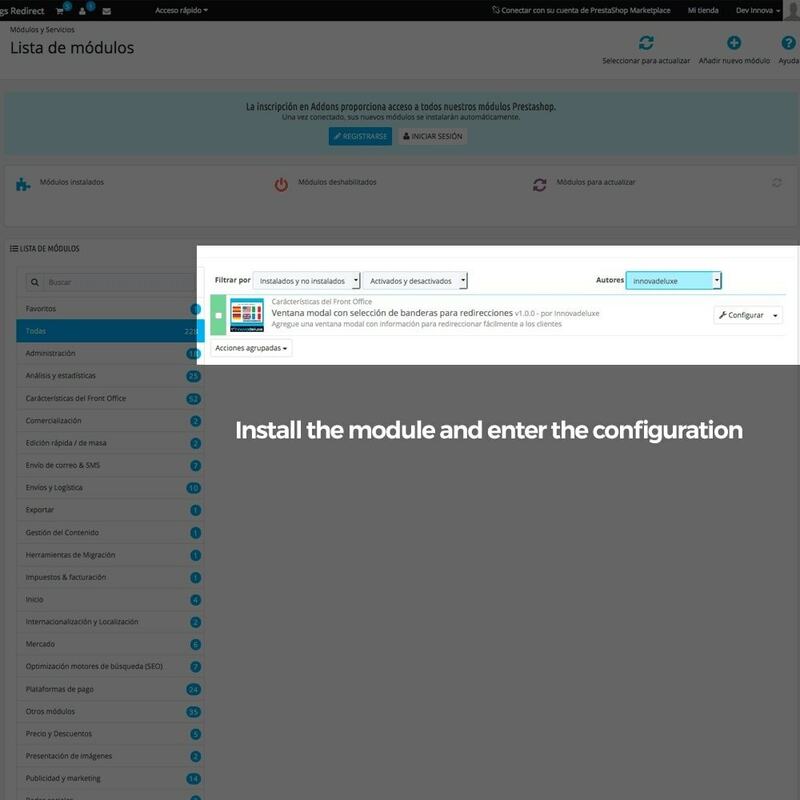 This module has been given this specific purpose, but could really be adapted for any other type of redirects, since it allows upload any image, do not have to be a flag. The adaptation of this module for purposes other than the specific one of the redirection through flags, is very simple, you just have to modify a CSS file, to change the width of the images so that it adapts to what is needed, in Just a few minutes you will have it to your liking. Add all the flags (or other different images) you need. Add a text for the ALT attribute of each image. Put a link to each image to redirect to that URL. Put if the link is opened on the same or a new page. Mark a flag like the one of the main domain so that it enters directly in the store. Turn flags on and off (or other different images). 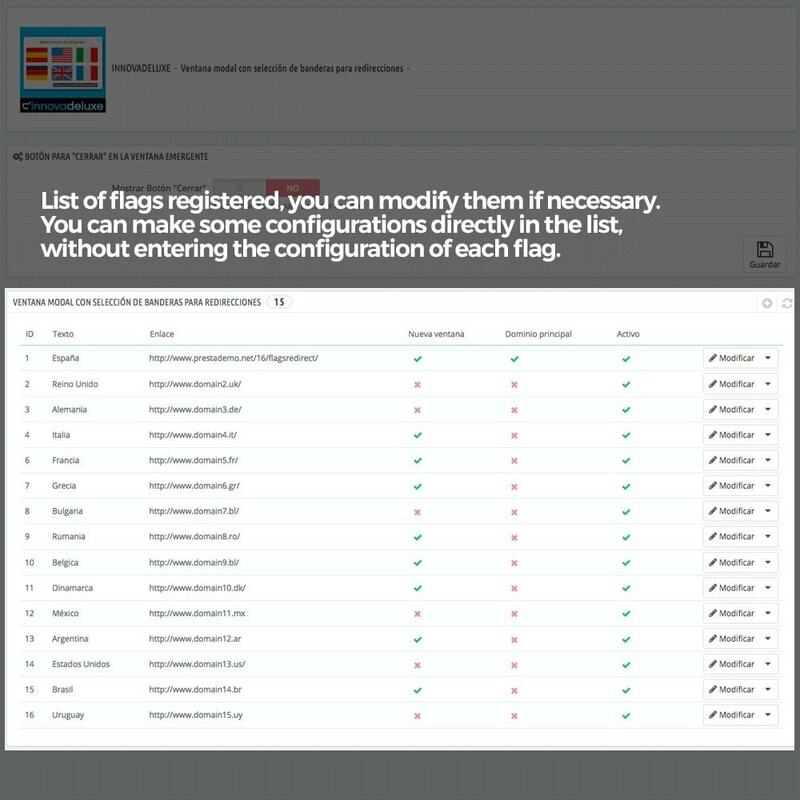 The module is responsive, adapts to the different resolutions to show the best possible way the flag grid. 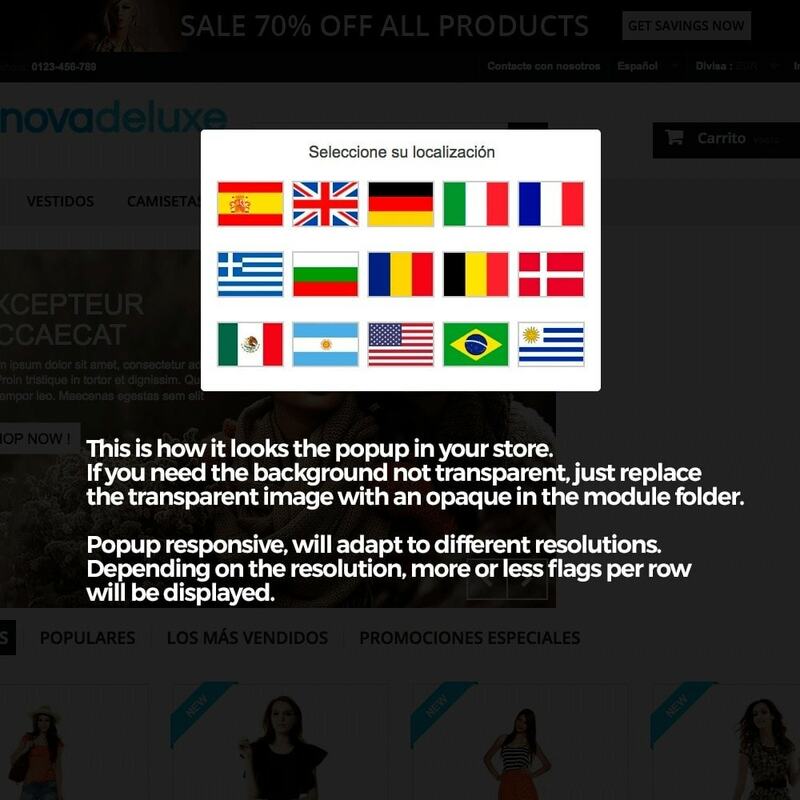 More or less flags will be displayed per row depending on the resolution of the device with which it enters the store. Your customers will be redirected to the correct store to make their purchases, either the store of your distributor in another country or one of its stores. In this way, you will avoid problems with your distributors by selling to customers in your country, especially if you have granted exclusivity of sale by zones, something very common in product wholesalers. Bringing the customer to the right site greatly improves the user experience and brand or company perception of you.